This is a two-part series. Next week, we discuss advantages exercising by yourself. Working out at the gym, in public, or really at all on some of our bad days, can sometimes be intimidating, boring, lonely, like a chore. 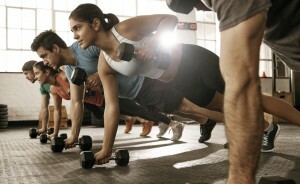 That is one of the reasons group-exercise is all the rage these days, and for good reason! There are a number of benefits to group exercise that may be just what you need to get you up and moving. 1. Accountability. It is so easy to talk yourself down. You could finish a little bit more at work, run another errand, get started on dinner, or hide in the den for a few minutes of peace and quiet. There are a million reasons to not exercise. Having a date with your exercise partner, a set start time for your class at the gym, or a training schedule with your team helps keep you on track, accountable, and moving forward on your goals. Even (and especially) when you are tired, distracted, or lacking your usual motivation, having a friend or group counting on YOU to motive THEM, can make all the difference. 2. Don’t get stuck in a rut. We all get into a routine because routines are easy. A teacher in an aerobics class, a friend with their own goals and inspirations, or a lifting buddy with new ideas for how to improve your workouts, can be a great way to keep you moving forward and getting creative, instead of getting bored or stuck at the same fitness level. Working out with others is one of the surest ways to keep yourself moving and trying new things. 3. Learn from others. Whether it’s in the weight room or on the field, you want to treat your body right and know the proper techniques and best strategies to meeting your goals. Fitness takes both knowledge and skill, and both of those things can also keep you safe and on track as you strive towards your goals. Finding a class to teach you new skills, or a partner to go over ideas with, can ensure you don’t slack off on form or get held back by your own head-space. 4. Be inspired. We all have moments of self-doubt. Surrounding yourself with others who are setting goals and succeeding can give you the inspiration you need to aim higher, keep striving, and stay motivated. And as an added bonus, you can be inspiring to others as you stay on track and meet your goals. 5. Have fun! Working out with a friend, in a class, or on a team can just be fun. We played all the time as children, and we should keep doing so as adults! Cardio on your own can feel like a grind at times, but cardio with friends and family can be full of friendly competition and a lot of laughs. Why not have fun catching up with friends, teammates, or family while keeping yourself in shape? You can tighten your social bonds while tightening your body! Absolute Wellness Center offers chiropractic medicine, physical rehabilitation, acupuncture, and massage in Eugene, OR. The clinic has a strong focus on sports injury prevention and treatment. To learn more, give us a call at 541-484-5777.